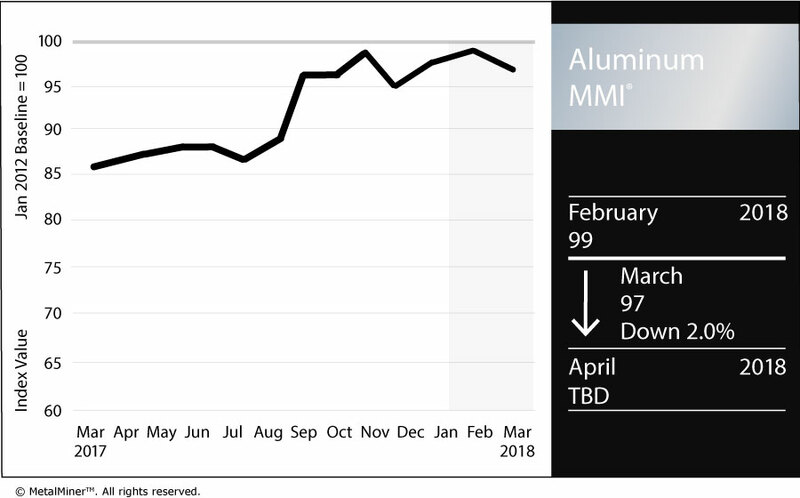 After last month’s increase, the March Aluminum MMI (Monthly Metals Index) fell two points for this month’s reading. A weaker LME aluminum price led to the retracement. 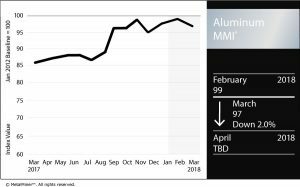 The current Aluminum MMI index stands at 97 points, 2% lower than in February. LME aluminum price momentum slowed this month. Despite the price retracement, trading volumes still support the current uptrend. The long-term uptrend remains in place. February brought much uncertainty to the domestic aluminum market with the release of the Trump administration’s Section 232 reports and recommendations vis-a-vis aluminum and steel imports. That release, together with President Trump’s announcement last Thursday of a 10% aluminum tariff on all imports have activated price warning systems for all aluminum and aluminum products. LME aluminum reacted to the news, increasing only slightly. Additional information about Trump’s announcement, combined with specific buying strategies, can be found in the MetalMiner team’s Section 232 Investigation Impact Report. On top of that, the U.S. Department of Commerce announced its final determination on the Chinese aluminum foil import case initiated in March 2017. The aluminum foil investigation includes all Chinese aluminum imports, and the anti-dumping margins vary from 48.64 to 106.09%, while the countervailing margins vary in the 17.14-80.97% range. This case may also add some support for LME aluminum prices in the short term. 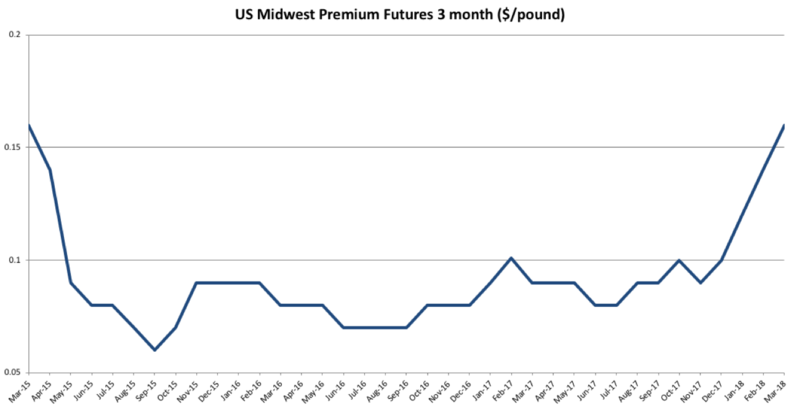 U.S. Midwest aluminum premiums moved again at the beginning of March and are currently trading at $0.16/pound. 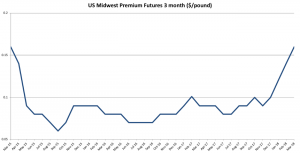 The U.S. Midwest Premium has now reached the same levels from March 2015; the pace of the increases appears to have accelerated since the Section 232 report release. The Section 232 outcome and President Trump’s comments around possible import remediation measures have caused increased volatility in the U.S. Midwest premium. LME aluminum price retracement may give buying organizations a good opportunity to buy, as prices may increase again. In bullish markets, buying organizations still have many opportunities to forward buy. Therefore, adapting the right buying strategy becomes crucial to reducing risks. Given the ongoing uncertainty around aluminum and aluminum products, buying organizations may want to read MetalMiner’s Section 232 special coverage. Global Precious MMI: Will Drop in Platinum, Palladium Prices Continue?